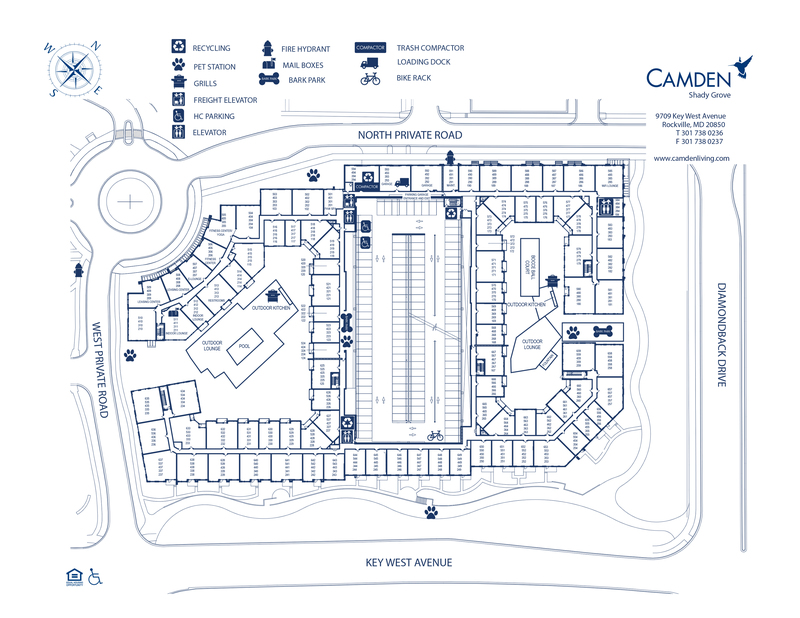 Come home to the best Rockville apartment living at Camden Shady Grove. Our studio, one, two, and three bedroom apartments plus loft floor plans are located in Rockville, Maryland down the street from the shopping, dining, and entertainment of Downtown Crown. Plus, we're only a few miles from Downtown Rockville. Beyond enjoying the small town charm that Rockville has to offer, living in these Montgomery County apartments also means easy access to the entire DMV area. Whether you are traveling to Washington D.C., Northern Virginia, or elsewhere in Maryland, you have easy access to I-270, I-495 Capital Beltway and also the Shady Grove Metro stop which services the Red Line. Starting or expanding your business? Tired of your long commute? We have the perfect solution – Live where you work in our live work apartment homes! Our community offers unique one and two bedroom live-work spaces that combine your business and residential needs. Our live work units include generous space for both needs. Reserved spaces for low-emission and fuel efficient vehicles, reserved spaces for electric-car charging and reserved spaces for rideshare vehicles onsite. Camden Shady Grove is going green and pursuing a LEED Certification for New Construction on this brand new building. Our teams have put energy-efficient details into many aspects of construction including designing stormwater drain off to sustain bio planters that create a healthier environment, installing water use reduction faucets that help the environment, and going above and beyond to save our residents money and help the environment by utilizing LED lighting in apartments and common areas. Additional amenities include controlled fob access, garage parking, conditioned corridors, onsite storage, serene courtyards, WiFi enabled common areas, e-Lounge with printer and online services including rent payment, service requests, lease signing and MyCamden – an exclusive resident social site. Camden Shady Grove apartments are conveniently located near the city’s finest cuisine, shopping, and entertainment found in Rockville. Spend the night out with friends at Downtown Crown Wine & Beer or Old Town Pour House. Swing by Ted’s Bulletin and Coastal Flats for a bite during Happy Hour. Alternatively, you can take a stroll over to the Shady Grove Farmers Market on the weekends at John Hopkins University – Montgomery County located just across the street, or grab groceries from Harris Teeter and enjoy a quiet night in. Have we mentioned the parks? Rockville is home to more than 1,000 acres of parkland composed of 33 passive parks and 32 active parks. Go on your daily run, bike, or walk the dog through the beautiful green space. Now stop reading and start living! You deserve this life. Contact us today to learn more – Call 877-418-3382 or view available apartments here. We welcome cats and dogs, up to two pets per apartment, with no weight limit. Complimentary visitor parking available on a first-come, first-served basis.